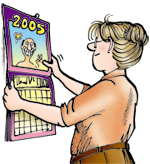 November | 2014 | FBorFW Strip Fix For Better or For Worse Comic Strip by Lynn Johnston. Lynn's Comments: I never chaperoned any of my kids' school events--for that, I think we will all remain grateful! This entry was posted in Uncategorized on November 1, 2014 by stripfix. Lynn's Comments: After Halloween, Katie would save up her goodies until Aaron went dry. Unlike her older sibling, she could restrain herself from eating all of her stash at once--which surprised me. Of the two children, she had the sweetest tooth. We even called her "Cake" instead of "Kate" because she liked desserts so much. At the end of October, however, willpower set in. She could hoard her gains in full view, then savour each morsel after Aaron's was long gone. I remember watching him as he pretended not to be fazed by the sounds of crinkling wrappers followed by lip smacking and the sound of "mmmmmm." I was surprised that he didn't pounce on her or ask me for a treat to make up for the discrepancy. He just put up with the injustice, and I wondered when and how he'd get even, because this would come about, guaranteed. Like my brother and me, my kids were creative teases! This entry was posted in Uncategorized on November 2, 2014 by stripfix. 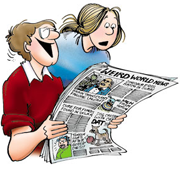 Lynn's Comments: The malapropisms kids use while learning the language are so much fun. Words like "awfuls" for "waffles" and "Anointed Stakes of America" made me laugh out loud. My mother told me she once wrote an essay on the copulation of Canada and how it grew bigger after the first world war. I never thought I'd get away with using that one, but I did. This entry was posted in Uncategorized on November 3, 2014 by stripfix. Lynn's Comments: The strips I did on skating and hockey moms always struck a chord. Parents who spend a good part of their time sitting on hard benches in cold arenas while their offspring scramble over the ice should be given their own special place in heaven. It will be warm, have comfortable seating and the coffee will not taste like socks. This entry was posted in Uncategorized on November 4, 2014 by stripfix. This entry was posted in Uncategorized on November 5, 2014 by stripfix. Lynn's Comments: This was another home truth I shared with my skate-mom audience. After hours of watching from the bleachers, you really do think you have good advice to give. Sadly, if you don't skate, your offspring will not be listening to anything you say--even though they OWE you the courtesy of a nod and a thank-you. This entry was posted in Uncategorized on November 6, 2014 by stripfix. Lynn's Comments: In North Bay, we had access to some great sports facilities, so the kids were soon skating, swimming, and playing hockey. My car was on the road constantly--ferrying them to the rink or the "Y," or wherever the game was to be, and I had a rule: four trips only. I would only drive into town four times in a day. This was met with some confusion, as I had counted each way, there and back, as separate trips! The rule was then changed to eight trips. AAAUGH! This entry was posted in Uncategorized on November 7, 2014 by stripfix. This entry was posted in Uncategorized on November 8, 2014 by stripfix. Lynn's Comments: Our house in Corbeil was hidden in quite a dense forest, so leaves and clippings could easily be tossed into the woods or piled somewhere for compost. Our house in Dundas, though (on which the Pattersons' house was based), was in a busy, upscale neighbourhood, where leaves had to be piled, pushed into bags, and left for city workers to remove. After a discussion about the waste we made with plastic bags, I decided to take a load of leaves to the dump myself, but in the back of the car, bagless. I only did this once. It was a nuisance, a mess, and created a lot of work! This entry was posted in Uncategorized on November 9, 2014 by stripfix. Lynn's Comments: Every now and then I could work in a "public service announcement" thanks to our in-house dentist. Grinding your teeth at night is something many of us do without being aware of it. You can even crack a filling with the strength of your jaw. A "bite splint" will help to relax your jaws at night and keep you from having that awful head-achy feeling in the morning. Sadly, it can't help to solve the problems that make you grind your teeth in the first place! This entry was posted in Uncategorized on November 10, 2014 by stripfix. This entry was posted in Uncategorized on November 11, 2014 by stripfix. This entry was posted in Uncategorized on November 12, 2014 by stripfix. Lynn's Comments: I have a friend whose worst accidents at home have been because of her dog. She has tripped over him, fallen over him on the stairs and she even broke her foot when he pulled her down an icy sidewalk one winter. Her favourite quote was "When I saw him at the shelter, I just fell for him!" This entry was posted in Uncategorized on November 13, 2014 by stripfix. This entry was posted in Uncategorized on November 14, 2014 by stripfix. Lynn's Comments: I think we would all be more eager to share, give, offer, help out and grant human kindness--if it was infinitely more rewarding. Yeah--you may hate me for it, but I said it! This entry was posted in Uncategorized on November 15, 2014 by stripfix. Lynn's Comments: Yes, this happened--and with all the theatrical sarcasm seen here. This was what made our marriage so much fun. We were both able to laugh and make jokes out of just about anything. This entry was posted in Uncategorized on November 16, 2014 by stripfix. This entry was posted in Uncategorized on November 17, 2014 by stripfix. Lynn's Comments: My dad always had beautiful window displays in his jewellery shop. The front windows were small, so we could really go to town--especially at Christmas. We couldn't afford new things, so we made do with wedding dresses from the Salvation Army for the snow, last year's Christmas cards for sparkles, and tinsel from our own tree. Mom found and painted tiny branches. She cut elaborate snowflakes from tissue paper saved from gifts and shoe boxes--and I have to say those windows were spectacular. Eaton's and the Hudson Bay stores in Vancouver had nothing on us. Folks would bring their kids by dad's shop windows just to see what we'd done that year, and if we were lucky, they'd come in and buy a gift or two. Interestingly, that wasn't the goal. We all loved the challenge of making that display the best it could possibly be. This entry was posted in Uncategorized on November 18, 2014 by stripfix. Lynn's Comments: I was a member of the Art Centre board in North Bay for a few years. In an effort to make the theatre more profitable, a friend and I drove to a neighbouring town's theatre to find out how they managed to stay in the black. Thinking they had a magical formula, I begged them to tell us the secret to their financial success. The answer, sadly, was Bingo. Bingo became one of our main resources, too. You'd think the wonderful art of live theatre would have brought in enough to pay the bills! This entry was posted in Uncategorized on November 19, 2014 by stripfix. This entry was posted in Uncategorized on November 20, 2014 by stripfix. Lynn's Comments: One year, my mother found a recipe for sugar plums. They were a lot of work, tasted awful, and gave us the trots. After that, "visions of sugar plums" had an entirely different meaning. This entry was posted in Uncategorized on November 21, 2014 by stripfix. Lynn's Comments: One of the reasons I don't volunteer to be a board member now is that I always have suggestions. My philosophy is--if you make a suggestion, you should be willing to act on it! With this in mind, I graciously decline opportunities to be a board member. Even at the age of 65, I still can't keep my mouth shut! This entry was posted in Uncategorized on November 22, 2014 by stripfix. Lynn's Comments: Once again--a true-to-life bit of stupidity became a Sunday strip. It was one of those things that made me say to myself, "What was I thinking? I KNEW that would happen!" Because these events made such good material, I was almost HAPPY to have done something silly! When I could use a situation, make fun of it, exaggerate it, draw all of the expressions, delve into the body language--I was grateful! Knowing this, my kids would try to diminish a situation by saying, "Hey, you can use that in the strip!" Using the strip as an outlet was convenient. I didn't need a therapist; I just poured my thoughts into the ether and waited for the results to come back. Always, there was someone out there who felt the same way I did, someone had had the same experience exactly and could identify. Their letters were wonderful. There's nothing more comforting than knowing you're not alone! This entry was posted in Uncategorized on November 23, 2014 by stripfix. This entry was posted in Uncategorized on November 24, 2014 by stripfix. Lynn's Comments: Farley was couch height; his face was perfectly aligned with yours if you were in repose. Should you then feel the smog of dog breath, hear the sound of heavy breathing, and smell kibble, it was not advisable to stir. Once you let Farley know you were conscious, he'd smother you with affection--and drool! This entry was posted in Uncategorized on November 25, 2014 by stripfix. This entry was posted in Uncategorized on November 26, 2014 by stripfix. Lynn's Comments: Having gone on several Medical Missions to Honduras and Peru, I am well aware of how little some people have and how much we in North America take for granted. When my kids said they were "starving," I was grateful that they had no idea what "starving" meant. This entry was posted in Uncategorized on November 27, 2014 by stripfix. This entry was posted in Uncategorized on November 28, 2014 by stripfix. This entry was posted in Uncategorized on November 29, 2014 by stripfix. Lynn's Comments: This was one of my father's "tricks of the trade." He had many ways to make tears disappear. He had stories and sayings and jokes and songs. He made faces, he danced and clowned--we had our own private vaudeville show complete with costumes, music, mime, and verse. He could be silly. He could delve into fantasy as easily as we could, and he saw things through our eyes, something few grown-ups have the imagination to do. Dad was like another kid who sometimes sided with us--against Mom. I remember her telling us and Dad to, "Please--GROW UP!!!" This entry was posted in Uncategorized on November 30, 2014 by stripfix.